You are cordially invited to attend the 19th International Congress of Chemical and Process Engineering CHISA 2010 and the 7th European Congress of Chemical Engineering ECCE-7 to be held in Prague, Czech Republic on 28 August - 1 September 2010. The series of International Congresses CHISA taking place in the centre of Europe started in 1962 in Brno, Czech Republic, then continued in Mariánské Lázně, and since 1972 the Congresses have been held in Prague. However, it is worth mentioning that the logo was used for the national event as early as 1953. The word CHISA originates from the Czech acronym for “Chemical Engineering, Chemical Equipment Design and Automation” and later became a “trade mark” for large meetings which have emphasised especially East-West-European and later pan-European contacts. Nevertheless, the stepwise development during the last two decades transformed the one-time European Congresses into an event of world importance. The PRES Conference (Conference on Process Integration, Modelling and Optimisation for Energy Saving and Pollution Reduction) has become an integral part of the CHISA Congress during last decade. 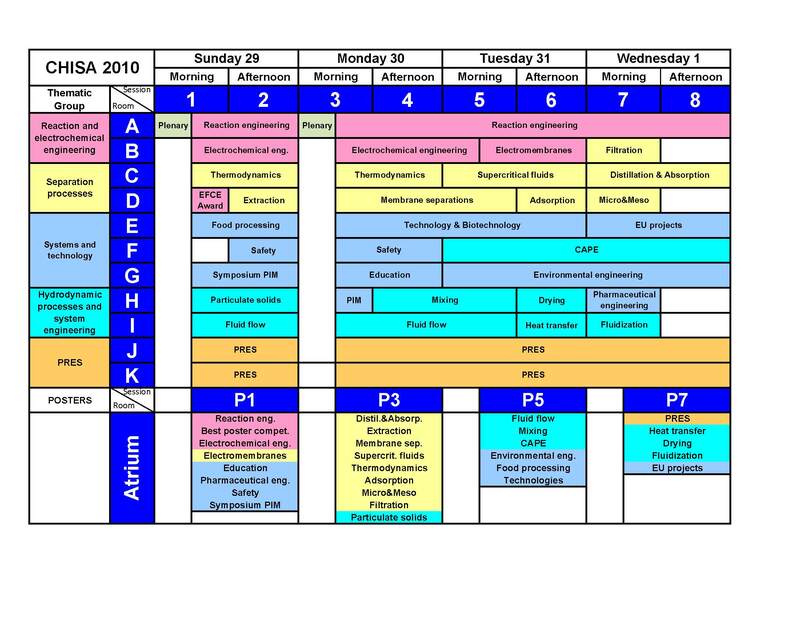 The series of ECCE Congresses on chemical engineering was launched by the European Federation of Chemical Engineering (EFCE) in 1997 in Firenze, the venue for the first ECCE-1. Since 1997, ECCE has been organized in France (Montpellier, 1999), Germany (Nürnberg, 2001), Spain (Granada, 2003) and Denmark (Copenhagen, 2007). In 2005, the ECCE-5 has been combined with the World Congress of Chemical Engineering in Glasgow. For 2009, it was decided by the EFCE not to compete with the 8th World Congress of Chemical Engineering in Montreal but to combine the ECCE-7 with the CHISA 2010. The objective of this exceptional joint Congress is to provide engineers, scientists, researchers, technologists, students and others a platform to present their latest results, to interchange ideas, to make new contacts, to establish new collaborations, and many more. The Congress addresses the full spectrum of chemical and process engineering practice, including current trends and future needs. I am very pleased to invite you to the 19th International Congress of Chemical and Process Engineering CHISA 2010 and the 7th European Congress of Chemical Engineering ECCE-7, which will be held jointly in Prague from 28 August to 1 September 2010. The joint Congress will be an exceptional event, as were until now both Congresses on their own. Like all the CHISA and ECCE Congresses before, even this joint one will cover a range of important topics and will offer many real interdisciplinary links. The logistics of the Congress program, which includes the satellite PRES 2010 conference as well as the standard sessions and specialized symposia, should enable the interested people to listen also to the presentations, which are close to their fields of research yet outside their everyday horizons. We shall also continue our effort in setting stronger measures on the quality of standard contributions, both oral and posters. Let me to mention one aspect which concerns just the posters: during the last couple of Congresses I have observed that some participants consider posters to be something less important than lectures. They are not satisfied if the Scientific Committee decides that their contributions should be presented in the form of posters and try to use any possible argument to change this decision. It is clear that the poster sessions are unavoidable at big Congresses because of the limited number of time slots for lectures. It should be however stressed that the posters do have equal scientific value as the oral lectures. Very often the poster, which is accessible for the whole day during the poster session, may stimulate much more intensive discussion and may have much higher impact than a time-limited oral lecture – provided the poster contains original results, is well structured and designed (and of course the author is present during the poster breaks!). On the other hand, I know that many participants ask in advance to present their contributions as posters and I have also noticed that the quality of posters’ design steeply increases. I can promise that the organisers will do their best to make the poster sessions even more attractive. I certainly know that there are other matters which have to be improved – we are ready to reflect your ideas and recommendations. Course "Workflow for product design and development"
On the occasion of ECCE-7/CHISA 2010, the EFCE President, Professor Richard Darton, and the Executive Board of the Federation invites you to participate in the EFCE Forum 2010. We look forward to meeting you at the first EFCE Forum in Prague. The 6-page fulltext of PRES 2010 will be published in Chemical Engineering Transaction, CET. The fulltext instruction is available HERE. Only the abstract will be published in CHISA Summaries. The author who will deliver the paper must register for participation and pay the registration fee before end of May 2010. Contributions without payment will be withdrawn from the final program. As it was announced, one author is allowed to present maximum two posters due to space limitation. Please check all your submissions, and if it might be your case, let us to know which excessive poster(s) should be disregarded. Otherwise the Scientific Committee will decide about removal of such excessive posters. Complete updated information about CHISA 2010 & ECCE 7 is displayed! Registration for CHISA 2010 & ECCE 7 is open. You can also book your accommodation or social program (under Application Forms). Deadline for abstract submission has been prolonged till 15 January 2010. Announcement about short course "Workflow for product design and development" can be found on page with Scientific Program. Topic  Electromembrane processes and integrated membrane systems has been newly added among Congress events, and it is open for application of contributions. 4 November 2009: Due to unexpected technical reasons we have to move the Congress date by one day. Therefore, the Congress CHISA 2010 & ECCE 7 will start on Saturday, 28 August 2010 (instead of Sunday, 29 August 2010), and the last Congress day will be Wednesday, 1 September 2010 (instead of Thursday, 2 September 2010). We do apologise for any inconvenience caused.